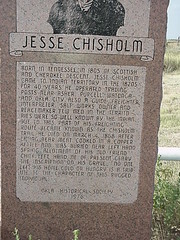 Born in Tennessee in 1805 of Scottish and Cherokee descent, Jesse Chisholm came to Indian Territory in the 1820's for 40 years he operated trading posts near Asher, Purcell Watonga and Okla. City. Also a guide, freighter, interpreter, salt works owner and peacemaker. Few men in the territories were so well known by the Indian. 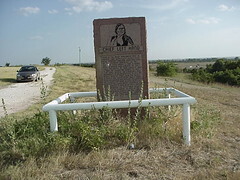 Due to this part of his freighting route became know as the Chisholm trail. 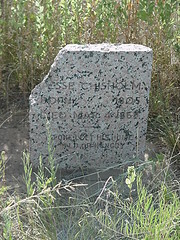 He died on March 4, 1868 after eating bear meat cooked in a copper kettle and was buried near Left Hand Spring Allotment of his old friend Chief Left Hand NE of present Geary the inscription on his grave. No one left his home cold or hungry, is a tribute to the character of this rugged individual. Chief Left Hand Born in the 1840's somewhere west of the present Fort Supply. 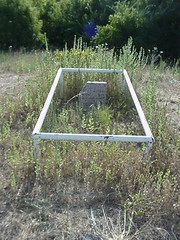 Left Hand ( Niwath also Nawathit) became principle chief of the southern Arapahoes on the death of Little Raven in 1889. A noted buffalo hunter and warrior he survived the Battle of Sand Creek in 1964. In 1867 he sign the Treaty of Medicine Lodge moving the Cheyennes and Arapahoes to Oklahoma and he and his people were at peace with the whites believing the Great Spirit would bring back the buffalo and return the land to the Indaians. Left Hand became deeply involved in the Ghost Dance movement in 1889. However in 1890 He actively backed the agreement to open their reservation to settlement. He died in 1911 and was buried nearby on this land which was his allotment. The springs bear his name. Left Hand Springs.